Eight years ago I wrote about the clicking noise I could hear in my brain when encountering arguments so devoid of reason that the resulting cognitive dissonance was paralyzing. This year, we saw that clicking noise manifest on the faces of journalists trying to wrestle ideologues and surrogates who abandoned reason in the most confounding election of our lifetimes. A candidate who felt safe to repeat claims and accusations so outrageous that it stunned us numb. A discomfort so great that the first impulse was to turn away, find a like-mind, and exhale. Because I believe that language matters, I would like to give those moments a name. They are easily recognizable and we have experienced them repeatedly this year. It is the blank stare that accompanies a hesitant silence as a brain struggles to reconcile new information with a deeply seated belief. The mental gymnastics of denial and re-framing that inevitably reconciles the conflict in such a way as to confirm the deep seated belief regardless of the validity of the data. As a nod to a previous post, l call those moments, ‘trucked’. Think elderly woman on Dr. Phil when she is shown concrete proof the the man to whom she has sent her entire life savings does not exist. In this fog, I ventured out again for the third presidential election: Thirty days, twenty nine cities, roughly a hundred and twenty interviews, three rallies and eight bowls of green chili stew. Much of what I experienced was unchanged. People deprived of safe venues at home or work, eager to share their election thoughts. I limited my taped questions to their feelings, needs and hopes, but off mic and tape, it was remarkable to explore their concerns and reasoning in more depth. It was in those later conversations that shared values and devastating divides could be found. But even as I made it through California’s central valley before turning left onto Route 66, something was off. A marked increase in people citing easily disprovable misinformation as part of their reasoning. And if I referenced equally easily verifiable data… Trucked. There was a consistency to these moments what demanded exploration. Or looking away. I really wanted to look away. Instead, by the time I hit the California border, I took to auditing the FM radio stations. Looking for conservative and Christian talk radio, I committed to finding and listening to what was said as I drove. Slowly, over the next month, there emerged a landscape behind which Donald Trumps inexplicable behavior came into focus. Some unofficial and statistically insignificant observations…. The FM band, especially in rural areas, is unrecognizable. In many areas in the south, talk radio accounted for more stations than music. Christian talk radio led the pack, followed by Christian music and then Conservative Talk. I was stunned by the miles I traveled when I could not located NPR and it was not until I was outside of Chicago that I stumbled on one progressive talk radio station. But the real difference was in the content. It was among the hardest things that I have done on these journeys. To make myself listen as very authoritarian sounding voices alternating between extreme fear mongering (a letter written from a dying woman who contracted AIDS from her HIV+ dentist because our PC nation allowed him to practice dentistry fully aware that she would die as a result) to protracted historical manipulations to prove that America was founded as Christian Nation and that the Obama administration had led and sanctioned an attack on Christianity. I would like to examine the phenomena and how I experienced it on the road through the lens of the most commonly referenced issue. Immigration. While many people cited immigration as informing their Trump vote, it was also heavily featured in both Conservative and Christian talk radio. Moreover, it was at the root of my personal ‘trucked’ moments. Let me explain. As a Christian, and having read the bible twice (full disclosure, the first time probably does not count because I was 16 years old and only had a King James edition), I could not reconcile my biblical understanding with the faith-based proponents of ‘strong’ borders. Even at a young age, I looked for patterns and repeated themes. One of the first I recognized was regarding Sojourners. Allow me to be clear. In my reading, there is no grey area as it regards the immigrant. No conditions on him being worthy or his reasons for fleeing his land. Eighty Two direct calls with no ambiguous language. Care for the stranger as you would care for yourself. Period. For the record, the second most referenced theme in the Bible is love with 300 calls. Homosexuality has 3 and two of those are ambiguous as hell. How is it that white Evangelicals could vote for Trump in record numbers? 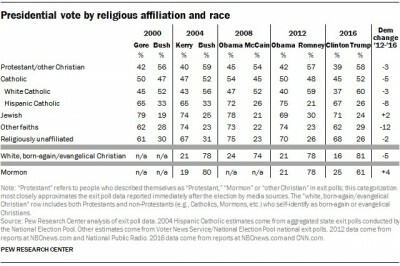 No single Christian group voted in such a high percentage for any recent candidate. How could it be that the most literal Christians could overwhelmingly support the most antithetical candidate? Turns out that they had help. The American Family Radio, Jerry Falwell Jr of Liberty University and James Dobson of Focus on the Family all figured heavily. How could it be that immigration would even be presented as a moral issue? Well, it takes some of the aforementioned ‘truckworthy’ mental gymnastics mixed with denial. It looked something like: ‘illegal immigrants are lawbreakers’ who ‘sneak into our country’ making it tougher for the real ‘good’ immigrants who are first in line. That this is biblically disingenuous is an understatement. But the frequency of Christian Trump supporters highlighting immigration is a proof point that this message is getting through. Finally, while there are many other subjects and issues that were noted in my interviews, in order, Obamacare, Muslims and the ‘attack on Christianity’, it is almost more important to note what was not addressed. Not once. In thirty days and more than 120 interviews (30 of which were conducted over 6 hours at a Trump rally) not one Trump supporter mentioned jobs or the distribution of wealth. The ‘rigged’ economic system of the Bernie campaign was morphed into a targeting of immigrants, Muslims and, for the religious, LGBTQ. Trump has not simply tapped into white anger over an economy that has left them behind. No, these were seeds thrown onto a soil that was prepared by Fox news, enriched by the ‘end-times’ Christian pulpit and radio, and fertilized by Alt-Right compost. This was the fruit of a full scale campaign by the conservative and Christian right to discredit all public institutions and redirect the justified anger of millions of disenfranchised Americans onto people and causes that had nothing to do with it. More about that in posts to follow. America, you are about to get flowers. In this case, really crappy flowers. Branded ‘Trump’. The wall becomes a fence that will be presented as though it has magic powers that keeps people from getting in a boat and sailing around it, or a plane from flying over it, but you are going to feel validated and safe as it accomplishes nothing. Obamacare will either be 1. repealed completely (to hell with the weakest among you) or 2. re-branded with modifications that would have happened anyway (this option comes with a victory dance and stomach turning self congratulations) or 3. handed over to a “Martin Shkreli” led free-market system where your very life is conditional on your ability to pay. Oh, and be ready, like the trains in Italy post WW1, there will be at least one tip of the hat to real change – most likely in the form of term limits. This will enable the new administration to claim the mantle of legitimacy. Finally, from every corner of talk radio (I’m looking at you Dennis Prager), the internet and the Republican Party Platform, they are coming for public education. Straight out of the totalitarian playbook, they need to re-write science, history and above all, civics, in order to ensure that truth is secondary to ideology. Welcome to the new American Madrasa. Make no mistake America, you got played. And if you start to act up, if you start to question what the heck is happening… well let’s look to history. What do strong men do? Putin, Un, Amin? They ensure the threat from outside pales in comparison. You just gave weapons to a guy with the ethics of a Nigerian prince, the ego of Kanye West, and the competence of a drunk toddler driving a golf cart. A man whose only ability to hold onto power will be creating a ‘them’ that is even worse. And that, we must never accept. So this is what I know. People of faith and Americans who still believe in our democracy and the institutions that support it need to fight for both. Because for every ‘trucked’ moment, there were pauses. Moments with the Beaseley’s, Tyra and even Calvin Craig when there was a silent stare of recognition. Water over stone, this can change. This entry was posted in Uncategorized and tagged discouraged by jm-admin. Bookmark the permalink. Oh! I was going to delete the shortuct to OpenExchange because I thought you were done. What a delight to see such a long and meaty editorial. There is hope. Always. In fact, are you not the one who taught me that? We will see in the coming year who got played. Might not be who we think. This is such a wonderful synopsis after a powerful journey and a (frankly) mind-boggling election. Thank you for writing this and sharing your perspective. Now we hunker down for 4 more years of the fight. Thank you for this cogent and meaty analysis of the joke that has just been played on the entire country! Thank you for taking on a subject that is too difficult for journalists in NY, DC and other media centers to tackle because it is easier to blame the economy and “uneducated” white people. It is safe to talk about the economy. It is far more difficult to talk about lies perpetrated on people that amount to hate speech. To bastardize the Bible is an insult beyond imagining to all true Christians. Remember the Christian arm band, “What would Jesus do?”. Indeed! He would embrace, live among, feed, and wash the feet of all those who the Christian Right now condemn! Keep writing Julie!! We need you! Last evening I attended a Transgender Day of Remembrance gathering at the Congregational Church in San Mateo. A mother told the story of her 13 year old son and his journey of realization that he was transgender. His family was very supportive, including his grandmother who, when he told her what he was going through, said “I think you are a beautiful boy and I think you will be a beautiful girl.” Sadly, his schoolmates, with whom he hadn’t shared his secret, still sensed his “differentness” and time at school was horrible. He was bullied and the school administrators and teachers didn’t do much to help. A few days before Thanksgiving last year he took his life. After she spoke, we created an alter with the photos and stories of dozens of people who had lost or taken their lives in the last year due to transphobia. Then we lit candles, small lights which have amazing power over darkness. Around 100 people were there, and we promised to stand together against hate, intolerance, bigotry, and fear, all of which had a hand in this year’s election. One minister and I were talking afterwards about how someone had told her “Jesus would have voted for Donald Trump.” “No,” I responded. “He might have had a meal with Donald Trump, washed his feet, forgiven his sins, encouraged him to be give all his wealth to the poor, but I don’t think he would have voted for Donald Trump.” Granted, he might not have voted for Hillary Clinton either! All those I spoke with yesterday, including the 13 year old boy’s parents, are committed to building a world with less bullying, more compassion, more listening to each other, and stepping up when we see someone being hurt or in danger of being hurt. We’ve got a lot of work to do and your trip, Julie, and your reflections on it, help us face the reality of what we’re up against. There’s a well oiled machine out there spewing out the seeds that as you say will flower in the coming months. We need to plant mustard seeds every single day everywhere we go, water those seeds, care for the tiny sprouts, and I do believe that if we do that love will win. One tiny candle can overcome the darkest night and a few mustard seeds can spread across the entire planet. Thank you for reminding us that words matter. We cannot shake off this past campaign season with the attitude of Newt Gringrich, that the rhetoric was a “useful campaign device”. The words spoken have given solace to the hateful, allowed them to emerge from the shadows. We cannot allow the normalization of this hate.